I have received a massive amount of materials and documents exposing the bloody crimes of the CCP's tyranny. It is because of the wisdom, courage, and unique insistence of those who have been falsely charged and wrongfully treated throughout China that these materials have made their way to me. Facing such tragic atrocities, we can no longer continue to be silent. Facing such horrendous acts of cruelty, our silence, and those who keep us silent, cause us to abandon our feelings and consciences as human beings. I have seen a lot of things in my life. However, seeing the photograph of 30-year-old Ma Zhixin's corpse made my blood boil, and I couldn't sleep at all that night. On the back of the photo, was written, “Ma Zhixin, a communist soldier transferred to civilian work, beaten to death by the police in the prison of the Public Security of Yabuli Forestry Bureau in Heilongjiang Province, had 11 broken ribs, a broken spine, and a body covered in wounds.” Is there no security for the soldiers that are transferred to civilian work? There is no protection for common people. Over the past several years, the Public Security of Yabuli Forestry Bureau in Heilongjiang Province has shown that they are nothing more than a gang of insurgents and bandits. They stoned petitioner Song Baozhu's house, broke the windows, and threw petrol bombs that set the house afire. 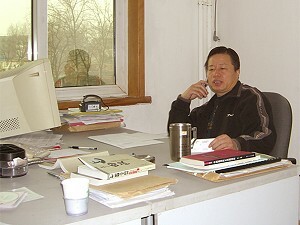 Lu Guiju, a petitioner, was also beaten to death. His family received only 150,000 YMB (approximately US$19,736) in remuneration for their loss. Being a demobilized soldier myself, I feel extraordinary grief over Ma Zhixin's death. It is tough for soldiers to transfer to civilian work. Leaving military service means that they have to compete with younger men to forge a career. However tough it is for them, they strive for survival in a peaceful way. How can trying to transition to civilian life cause such hatred from the police? The horrifying image of Ma Zhixin's corpse is tragic, shocking, and startling. It reveals the terrifying hatred of the “people's police” towards soldiers transferred to civilian work—the same soldiers who defended the rights of those policemen. We cannot imagine the despair and suffering Ma Zhixin experienced just before his cruel death. His photo torments us. I request, as an individual human being, for the authorities to punish the killers, adequately compensate his family, and apologize to the public, and thereby demonstrate some humanity. The deceased is long gone, but what's left for those of us who remain? His photo is a warning to all of us: “Beware of the existing communist dictatorship and its brutal nature.” With that, we share the pain and burden of Ma Zhixin's family. However, in order to stop this terrible evil, Ma's spirit and his family need to report the violence to the United Nations Commission on Human Rights, to Mr. Rogge, President of the International Olympic Committee, and to the parliament of every country. Enlarge Ma's photo, and imprint it onto the minds and hearts of every soldier—any soldier—who might be transferred to civilian work. Imprint it onto the heart of every Chinese citizen. The picture is more powerful than any words. May your soul rest in peace, Ma Zhixin. The slaughtering of innocent people might create a temporary roadblock, but the journey to Chinese human rights will continue from where Ma Zhixin fell. Midnight, September 5, 2007 in Beijing.